No sugar, including juice, or simple carbs (or artifical sweetners) for 10 days. Done. Finished. Successful. No cereal for cereal with sugar (threw out the cereal). 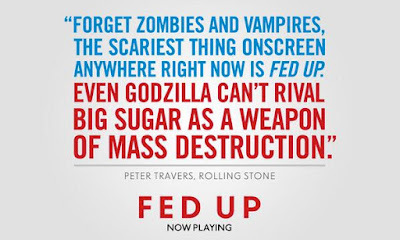 Watching the Fed Up movie had a major impact on my attitude towards food and the food industry. It made me angry and anger is a great motivator. I realize I only heard one point of view, but look around and the reality is that we many of us are eating ourselves sick. I volunteer at our hospital's gift shop. Every single food item in the shop contains sugar or artificial sugar. Every single one. The costs -- emotional, financial, etc. are staggering. If you are thinking about taking this challenge, strongly recommend getting pumped up by watching the movie first. I didn't have any huge cravings (except over what I was drinking). I didn't measure, keep track of what I was eating, or count calories. I got hungry between meals and when that happened, ate an apple or had a handful of almonds and sipped some ice water. But it's only 10 days. 10 days is easy. A lifetime is not. Problems with the Fed Up Challenge itself: there is no clear list of what is and is not acceptable. Triscuit has 100% whole wheat flour, salt and oil. Was that ok? Were tortilla chips ok? Popcorn? I didn't eat them because I quickly wanted to use this opportunity to lose weight. But I think they are ok. I think the point was to eliminate sugar and artificial sugar, and that was clear, but there was no message on the other stuff. And I got recipes sent to me, one of which included white pasta! No idea, but most 60 something overweight women do not change their eating habits. That is reality. However, my sense of fair play (don't want my money supporting bad public policy), and my desire not to have a stroke are strong motivators. I want to sustain it. Dinners (making separate dinners for us is not going to happen), eating out, and traveling will be a challenge and therefore, I intend to be reasonable about keeping with the challenge most of the time -- we love pizza! I'll let you know how it goes! Hey Vicki, thanks for the heads up on the link. I changed it. I applaud you for sticking with it, even if only for the 10 days. I'm not sure it's something I could do for a lifetime - or even for 10 days - but I do see the need to try. There are just so many conflicting reports on sugar, calories, fat, carbs, etc., etc., etc. and the information changes depending on who publishes it. I agree on the conflicting advice. Coffee is good or bad. Ditto wine. Ditto grains. It's crazy! HURRAH for you! I too think sugar and hidden sugars need to be downsized in our daily intake. Going for fresh fruit when that "need for sweet" sneaks up on me is my goal. summer is a great time for sweet fruit! Congratulations! I know I need to give it a try. I am working on eliminating some of it, i.e., soda, candy & some backed goods. You should be very proud of yourself & thanks for the push! Great job! I pretty much avoid sugar 24/7. It has an insidious way of being habit forming! I make most things from scratch so I know what's in them. Unfortunately, I'm not crazy about the taste of stevia, so I occasionally use honey or maple syrup to sweeten something to my liking (ie. not much I think most prepared foods are waaaay over sweetened). I don't worry about it when I eat out though. That's not all that often, and I figure there's no sense stressing about it. Tanis, I totally agree. It's near impossible to avoid sugar permanently. Glad you hung in there and lost those 6 pounds. I basically follow form of Southbeach Diet. I use Splenda, but maybe someday, that will be cut back. Eating vegetables and not craving the junk is the key. I am 11 months following that eating plan and have lost 39 pounds. There is still more to go, but getting healthier is the key. Thanks for hanging in there with your eating plan and sharing it on your blog. Great job to keep it up for the 10 days! I have been trying to eliminate the mindless snacking that happens throughout the day, and it has been a wake up call to realize how often I would do that! It might be too hard to eliminate sugar entirely, but I agree we eat way too much of it without realizing it. Thanks for sharing your journey, and yea for 6 pounds lost! I love your blog, Joan. My life seems so far removed from yours (rural Wisconsin - farmer). In common, I like to stamp and create. Thank you for posting your sugar-free 10 day challenge. You continue to inspire me. What a sweet note. thank you!! I cannot imagine how hard it must be to live and work on a farm. i am impressed! 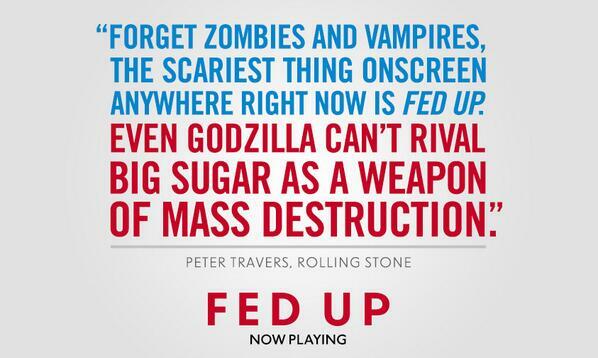 I watched the Fed Up movie and it was very informative. I'm a child of the 50s and love love all things sugar. I'd already made a conscious effort to eliminate sugar when hubby was diagnosed with diabetes type II. But I never weaned my successfully from sweets. The movie totally got to me. This week I shopped for my family and spent more time doing so than ever. I tried a few new recipes and about half were successful. With the Avian flu attacking chickens we're buying organic eggs. The dang chickens in our neck of the woods are $12. So that won't be happening. In conclusion, it's good to be informed even if only small changes are made in our way of eating. Thanks for the heads-up and all the best to you as you continually strive to improve yours. Thanks Erica. I am also a child of the 50s and started life with a combo of milk and Karo Syrup. cannot believe I have any teeth left! Yup. small changes are probably the sustainable ones. Hi Joan. Congrats on your accomplishment. I watched the movie and went through the challenge last year. I am a sugar and carb junkie. Since I am used to "clean eating" most Mondays and Tuesdays after a weekend of junk food eating, the first days of the challenge were easy for me. I ate lots of fruit and vegetables and lean protein; no breads which have added sugar, and no processed foods which also have added sugar. By day five, I was starting to go crazy. I made it through the ten days only because I knew it was coming to an end. My cravings for sugar and carbs never lessened. I have read that it takes about three weeks to form new habits. I hope that someday I will try to retrain myself to eat reasonable portions of sugar (I overeat ice cream, candy, cookies). Like you, my main reaction was in terms of what I learned about the food industry and our government which enables the industry. Americans have a huge problem with sugar, fat and carbs. Most people do not realize how much added sugar is in their food. Our country is physically and mentally addicted to fat and sugar and I learned just how deliberate it all is. Perhaps the strict 10 day regimen will help with moderation in the future, if not altogether eliminating sugars. Sugar is stored in your red cells and you can lower the level and feel better. I have to clear it out to a certain extent every now and then because of a low blood sugar problem. Sounds like a contradiction, but with low blood sugar you get a high and then crash lower than you were to begin with. I get all gung ho about abstinence or moderation every now and then, but never stick with it. I'm a real pushover. It's too easy to fall prey to a bagel at work. Good luck, Joan, and congratulations on accomplishing your goal!